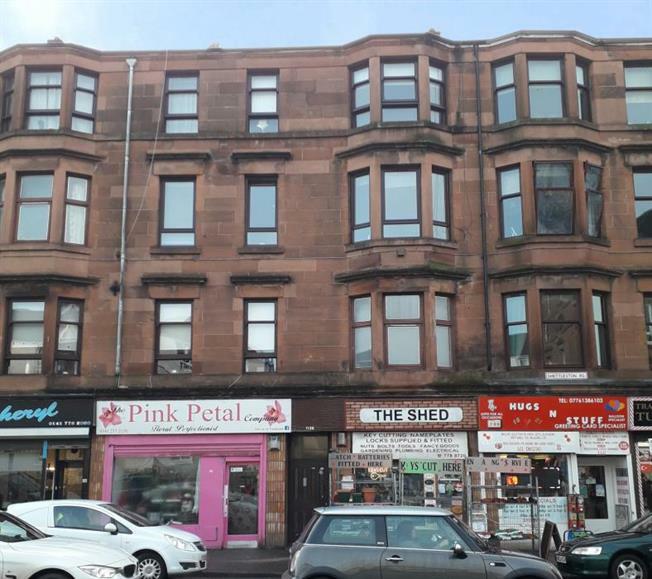 2 Bedroom Flat For Sale in Glasgow for Offers Over £40,000. A traditional sandstone bay windowed 2 bedroom second floor flat which is located within this popular area. This property has all of the makings of a lovely home and will be of appeal to a number of buyer types. There is a host of local amenities on your doorstep and also excellent road links for those looking to commute to Glasgow and throughout the central belt and beyond. Accommodation comprises: Entrance hall. Bay windowed lounge. Kitchen. 2 bedrooms. Bathroom. Communal gardens to the rear. Early viewing is highly recommended to avoid disappointment. Property is sold as seen. Hall - 8'2" - 3'11" x 11'2"
Lounge - 16'1" x 11'2"
Kitchen - 7'7" x 6'7"
Bedroom 1 - 13'1" x 6'11"
Bedroom 2 - 11'10" x 10'6"
Bathroom - 6'7" x 4'7"